1. Loyalty Program Engagement – How do we get our loyalty program members more engaged? 2. Attracting Millennials – What can we do to attract millennials to our loyalty program? 3. Member Contact Strategy – How can we employ the right loyalty program contact strategy for each member? 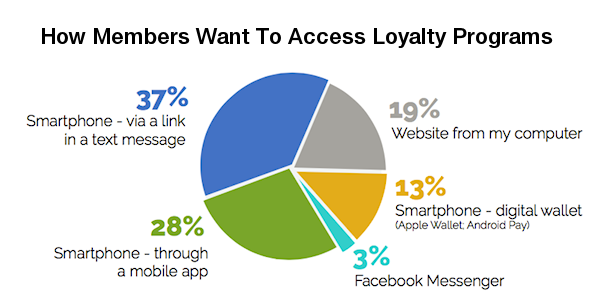 Marketers have turned to mobile loyalty program strategies to address these challenges. Mobile rewards programs are the new requirement for the majority of today’s consumers, with 75% saying that they would be more likely to participate in loyalty programs if the programs could be accessed from their smartphones. But, to be effective, mobile loyalty programs need to meet the engagement needs of each member. Great loyalty program engagement starts with giving each consumer a choice in how to access your loyalty program. Some brands believe that a mobile app is the key to mobile loyalty success. But a mobile app represents only one mobile communication channel, and each member has her preferred mobile channel in which to engage with loyalty programs. (SMS, mobile app, mobile wallet, or Facebook). A channel that works for one consumer may not work for another. And this is where an omnichannel approach to mobile rewards programs comes in. An omnichannel approach to mobile loyalty should address the entire loyalty program workflow: initial contact > enrollment > program engagement > ongoing messaging > rewards redemption. For more information on taking an omnichannel approach to mobile loyalty, I invite you to download our ebook The Expert Guide To Mobile Loyalty Sign-Up & Engagement.